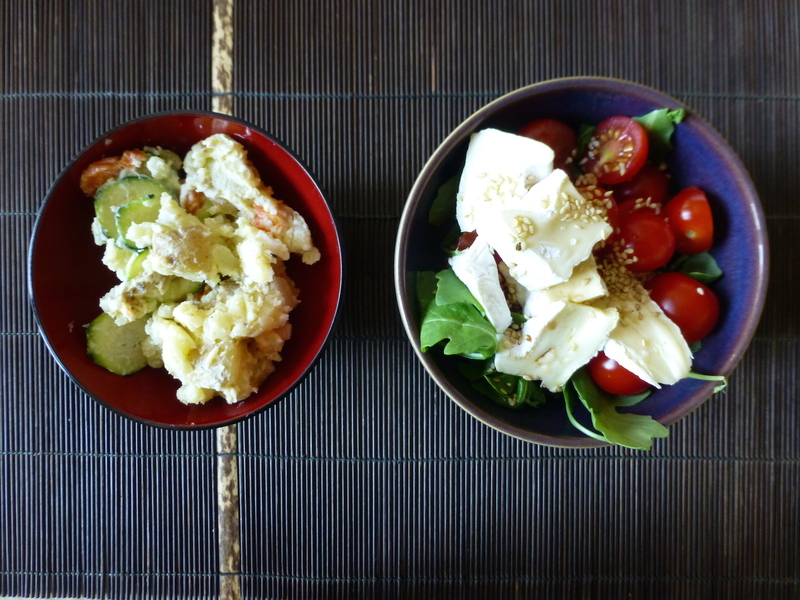 Japanese-style potato salad • Quick & Tasty - Get Cooking! Although potato salad may not sound very Japanese (maybe a bit more when you call it ポテトサラダ, “potetosarada”), it has long been very popular in Japan. There are some original Japanese recipes at Just Hungry and Just One Cookbook. My version is a little bit different: I prefer the potatoes unpeeled, I add some ginger and I use courgette instead of cucumber because I find that British cucumbers are too different from Japanese kyuuri. I serve this potato salad sometimes with rice, or with a side salad as in the picture. Wash but don’t peel the potatoes; wash the carrot and scrape or peel. Boil the egg(s) until hard-boiled (10 minutes). At the same time, cook the potatoes in the microwave for 5 minutes at full power (900W). Add the carrot to the pot, cook in the microwave for another 5 minutes at full power (900W). In the meantime, slice the courgette and the ginger very thinly. Peel the hard-boiled egg and chop up finely. Leave the potatoes and carrot to cool until almost room temperature. When the potatoes and carrot have cooled down, mix in the courgette, ginger and egg. Mix in the mayonnaise and mash coarsely with a fork.